NOTICE IS HEREBY GIVEN that at the Consolidated Election to be held on Tuesday, the 2nd day of April, 2019, the following proposition will be submitted to the voters of the Joliet Park District, Will and Kendall Counties, Illinois. Joliet Park District currently operates 65 community parks and 23 facilities, located throughout Joliet, while also overseeing a number of large community events like the Taste of Joliet, Airport Fest (FREE), Back to School Fest (FREE), Concerts in the Park (FREE) and Touch-A-Truck (FREE). The above projects from the 2014 referendum have been completed within budget. The Joliet Park District celebrates 97 years of serving the community in 2019, with a number of facilities 50+ years old (Woodruff Golf Course - 93, Inwood Golf Course - 88, Bird Haven Greenhouse - 90, Joliet Regional Airport - 90, Joliet Memorial Stadium - 70, Wedgewood Golf Course - 50). 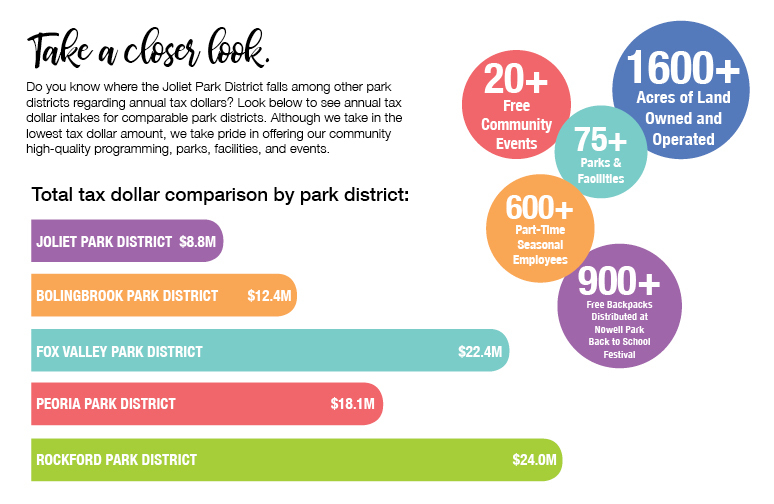 The Joliet Park District currently collects approximately $8.8 MM in tax revenue annually. Local Park Districts that offer comparable services/programs like Bolingbrook Park District ($12.4 MM annually), Peoria Park District ($18.1 MM annually), Fox Valley Park District ($22.4 MM annually) and Rockford Park District ($24 MM annually) currently receive significantly more than the Joliet Park District, year over year. Park Districts optimally operate with a 50/50 balance between tax revenue and program fees. The Joliet Park District is currently operating with a 32/68 balance, with program fees responsible for a significant portion of our budget. The Joliet Park District's budget is heavily weather-dependent, with revenue generators like golf, softball, Splash Station, and the Taste of Joliet reliant on good weather. If approved, funds from the limiting tax rate increase would impact the entire Joliet Park District, from community parks to facilities to programs and events. Improved security at our parks, critical facility updates and renovations to parks throughout Joliet would be addressed. The financial impact of the proposed tax increase would amount to $7.10 per month on a home valued at $100,000, or $85 annually. The median home value in Joliet is currently $165,000. A home at this level would pay an additional $11 per month. Finally, the Joliet Park District has many critical needs at this time. If voters approve the increase on April 2nd, the Joliet Park District will not begin to receive funds until January 2020. So please be patient with us as we address these needs.